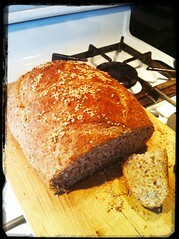 There’s few things that make a home feel cozy, warm and welcoming as the smell of fresh baked bread. Here’s a simple recipe that is guaranteed to do just that! For two 2 lb. loaves. 1. Whisk the water, salt, yeast, olive oil and milk powder (in you want) in a bowl. 2. Add the flour slowly. Start with 4 cups of flour and then add the last few cups slowly (kneading it by now). 3. Once we kneaded the dough and achieved the proper consistency, let it rise in the oven for about 40 min. to an hour. 4. remove and shape into loaves, place on flat baking pan (or cookie sheet) with light coating of corn meal to help dough from sticking. Brush water on the exterior, score the top of loaves and sprinkle the sesame seeds on top. 5. Let it rise again for another 40-50 min.